Edradour is the smallest traditional distillery in Scotland. It's a Highland distillery, located near the village of Pitlochry. For a small distillery, it produces a vast range of whiskys. 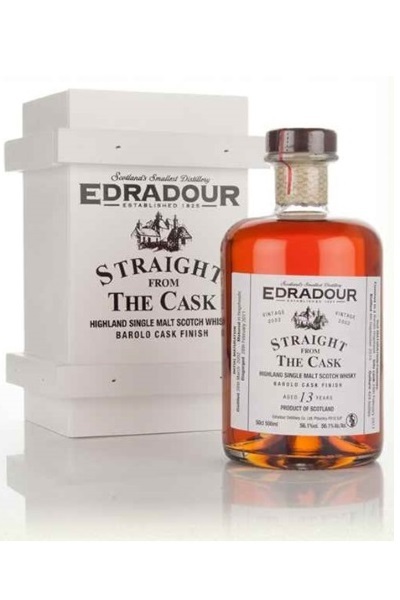 This one (~€75) is from the "Straight From The Cask" series. These whiskys are doubled matured, firstly in ex-bourbon casks. This is a 2002 vintage, which was transferred in 2011 to finish in hogsheads which previously held Barolo wine. It was bottled in June 2015, one of only 417, at 57.2% ABV.